I was lucky enough to receive a very early copy of Out of the Park Baseball 13 and the first thing I did was simulate the 2012 season. 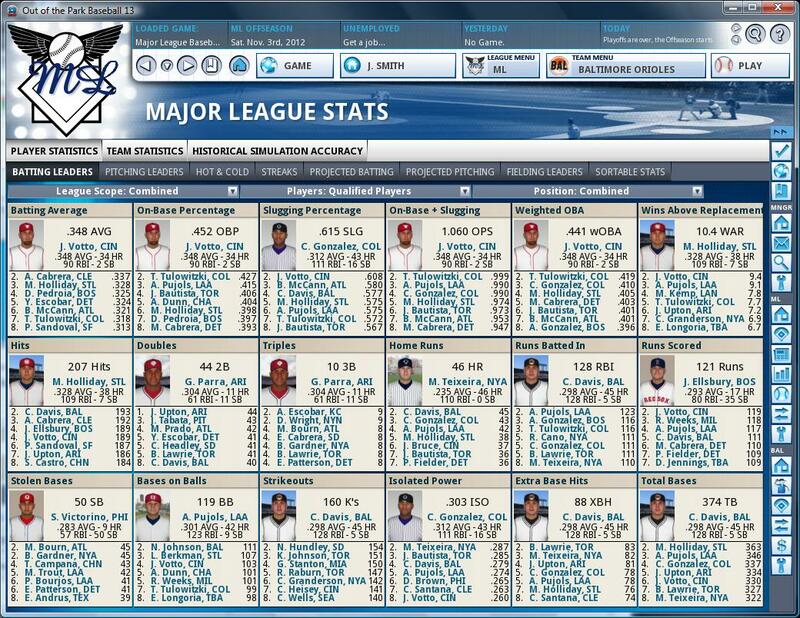 I kept all settings on default and did not interfere with my Red Sox. This was very hard to do since I have some strong opinions on who should be in the rotation and who should be in the pen. 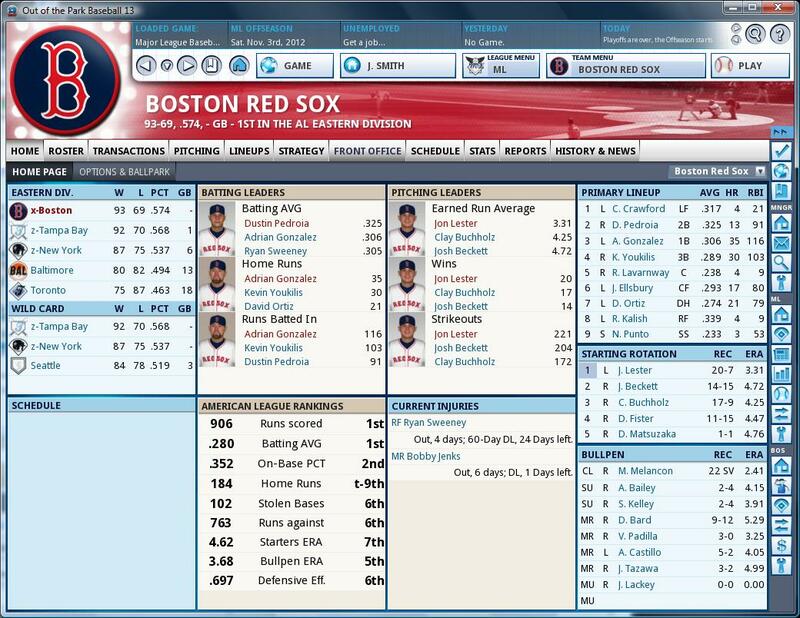 To OOTP13's credit the Red Sox had the same five man rotation as the real Red Sox do currently with Daniel Bard and Felix Doubront in the rotation with Alfredo Aceves in the bullpen. Let's take a look at the final standings. For those of you wondering why the logos are not correct for all of the teams, keep in mind I simulated the season as the first thing I did when getting the game and did not do any customization of logos. Great news for Red Sox fans as they managed to win the division. The Red Sox actually spent much of the first two months of the season languishing in third place. The Tampa Bay Rays started the season 28-9 and were looking like they were going to run away with the division. The 2012 season also brings about some changes to the playoffs which I love. 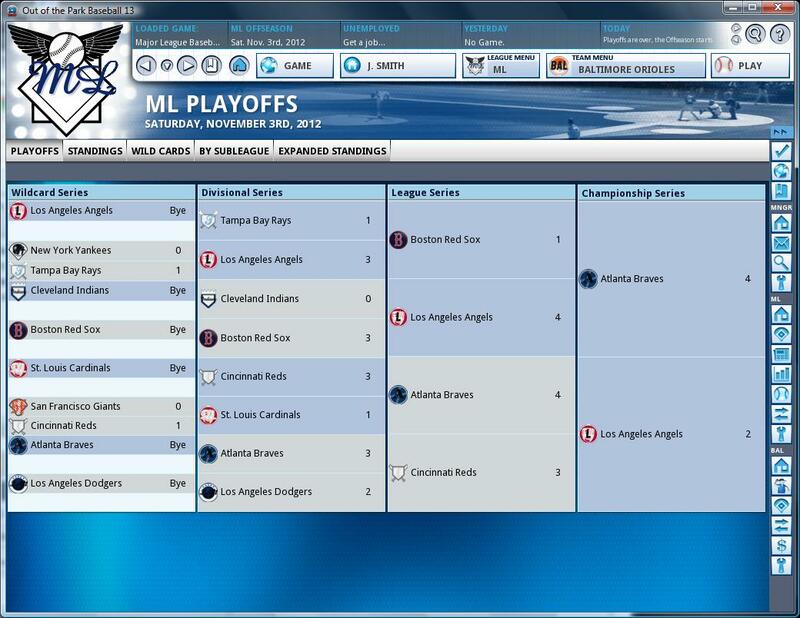 Two wildcards make it from each league and they play each other in a one game playoff. For a while it looked like it would be a Red Sox vs Yankees one game playoff which I think is a very real possibility for the actual 2012 season. Here is how the playoffs played out. 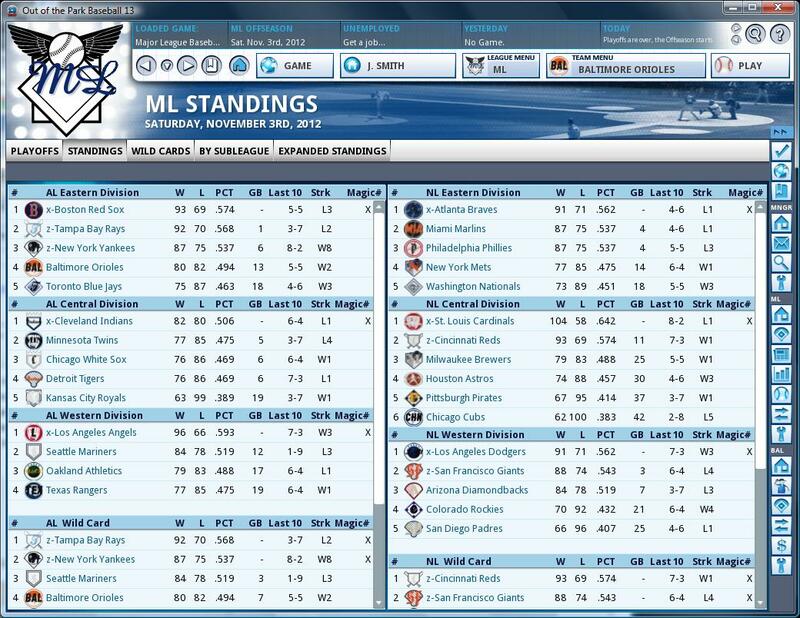 The Braves take the title but more importantly no wild cards made the World Series. The new rules will make it harder than ever for the wild card team to win it all and that is what I like about the new playoff format. Next up is the pitching leaders. How good is Matt Moore and Stephen Strasburg? Real good! A couple of things, John Lackey is supposed to miss the entire season but the OOTP engine had him coming back right around the same time as Daisuke Matsuzaka. For those of you thinking about buying the game this is something you can easily fix. Doug Fister was obtained in a trade just before the deadline. The Red Sox sent Cody Ross packing along with minor leaguer Bryce Brentz. 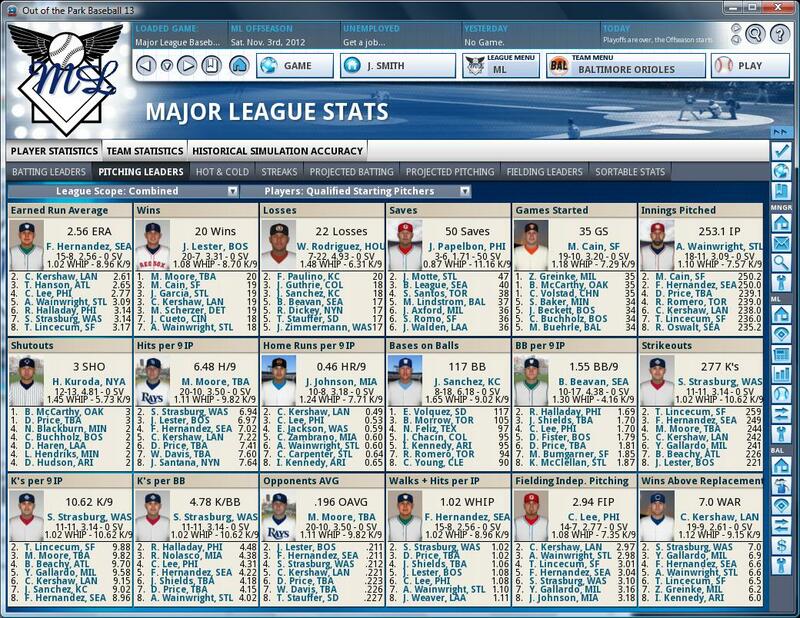 Here is more detailed stats for the Red Sox in 2012. Carl Crawford is the story here. He battled injuries all season long and only appeared in 61 games but in that small sample size he appeared to look like the player he was in Tampa..